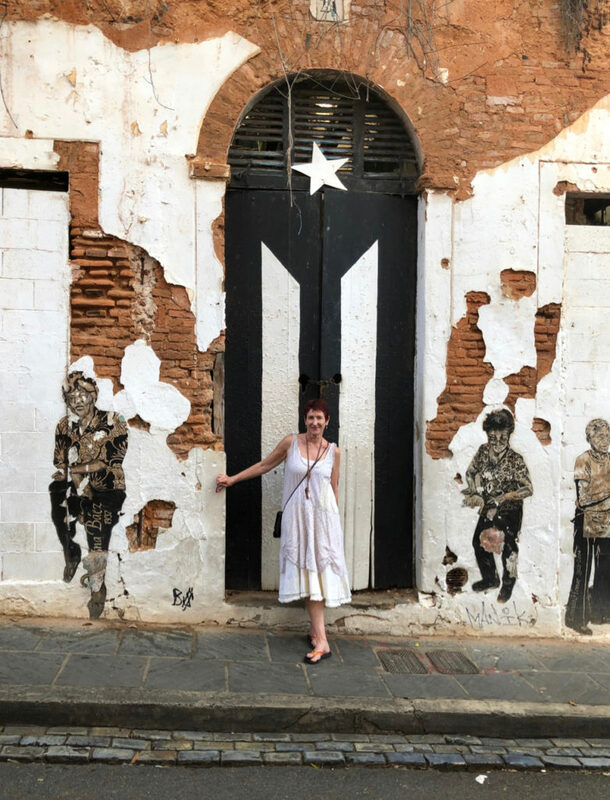 The dictionary lists the second meaning of “magical” as “beautiful or delightful in such a way as to seem removed from everyday life.” This is precisely the feeling I get from spending time in Old San Juan. It is all at once a delightful mix of ancient, historical, modern, urban and tropical. It is brimming with art, music, architecture, food, and drinks. And its people add the final sprinkle of pixie dust to the scene with their warmth and hospitality. 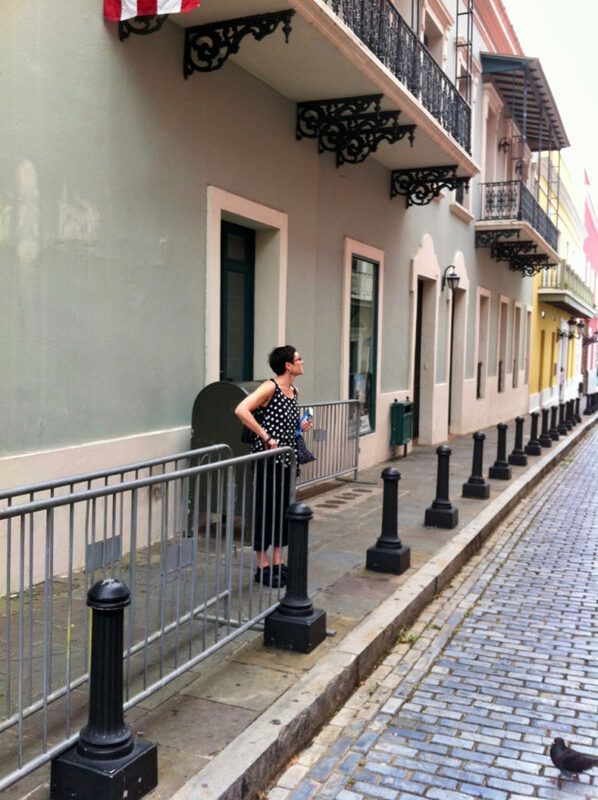 Recently I got to spend a couple of days in Old San Juan while my husband went off to visit a friend in another town. I was left on my own to wander and explore the old city all of which I did on foot. I recommend this as the only way to experience this part of San Juan. The city’s 45 block grid is totally walkable while its narrow brick paved streets are not car friendly and can be very congested. Walk! My enchantment on this stay started at the Hotel El Convento at 151 Calle del Cristo. This hotel would typically be out of my price range, but I decided to splurge for this short stay. It was completely worth it. 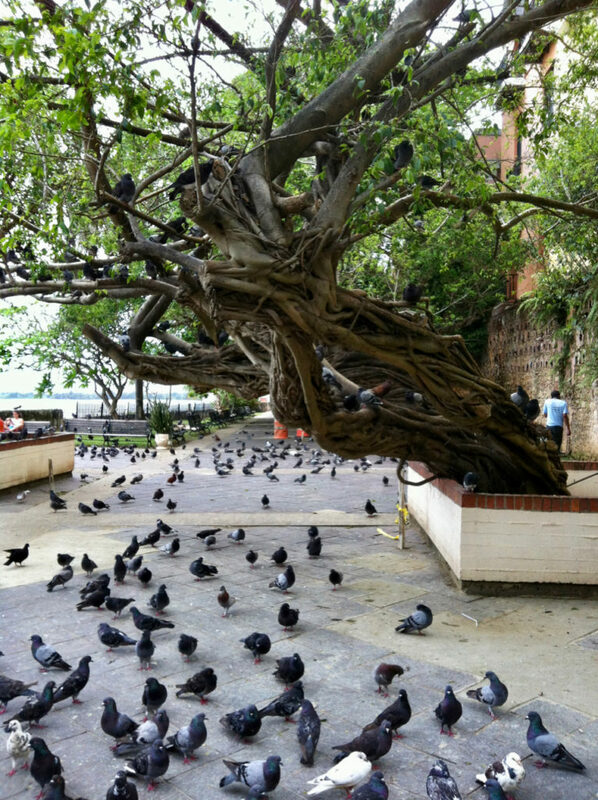 From the moment you enter this place, you feel immersed in all that is San Juan. As its name suggests, the hotel’s beginnings, some 350 years ago, was as a Carmelite convent housing nuns for 252 years. It is the oldest member of the Historic Hotels of America of which, another home state favorite, The Grand Hotel on Mackinaw Island, is also a member. It is luxurious without being stuffy and an utter delight. The bright yellow facade of the hotel is the first clue that you will be welcome here. You can savor its beauty standing in the shade of the little park, Plaza de la Catedral, just across the narrow blue brick paved street in front of Hotel El Convento. While in the park, be sure to view the whimsical sculptures and take in the street music which is often present. Then make your way up to the entrance of El Convento and step through the enormous double doors which are usually flung open wide. It is dark and cool in this place of entry, especially until your eyes adjust. Once they do, experience the cool breeze wafting down the entry hall. Savor the amazing black and white tile floor polished to a high shine and the old furnishings and paintings perfectly placed throughout. If you are not staying, you can still visit this space and head back to the courtyard restaurant for a drink and a bit to eat. If you are staying, you’ll enjoy the upper floors of the property with their open halls (peristyles) encircling the center open courtyard and set with quaint patio tables and chairs. Also as part of your stay at El Convento, there is a wine and cheese party each night on an upper terrace overlooking the Plaza de la Catedral. 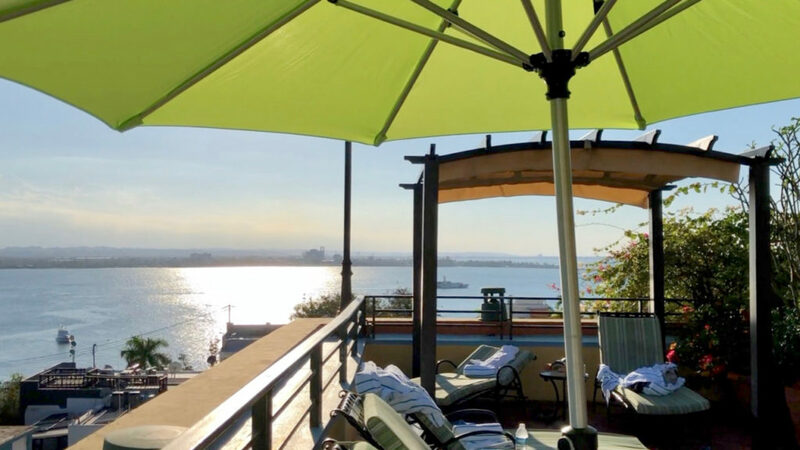 And, don’t forget to take a swim in the rooftop pool; it’s perfect for cooling off after a day hiking around the city, and its views of the surrounding neighborhood and ocean are to die for. 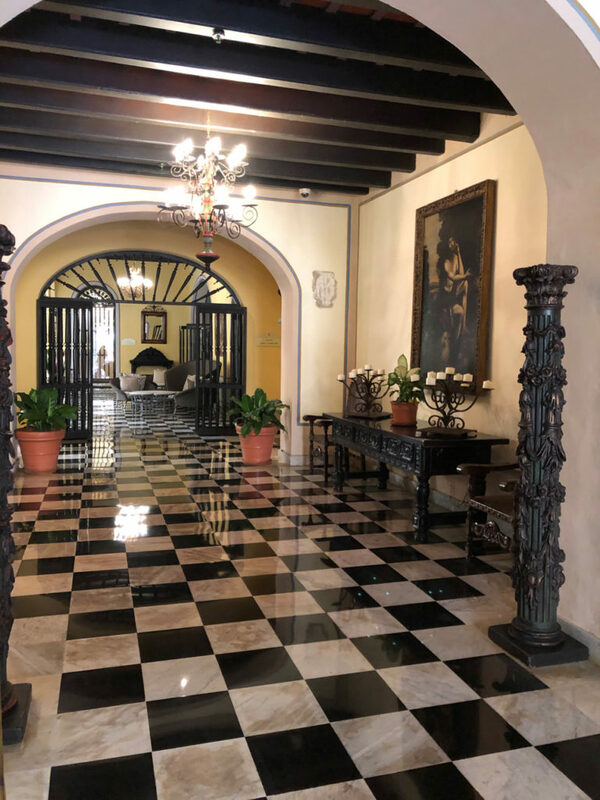 With the hotel El Convento as your launch pad, here are my recommendations for two days worth of magical removal from everyday life in Old San Juan. 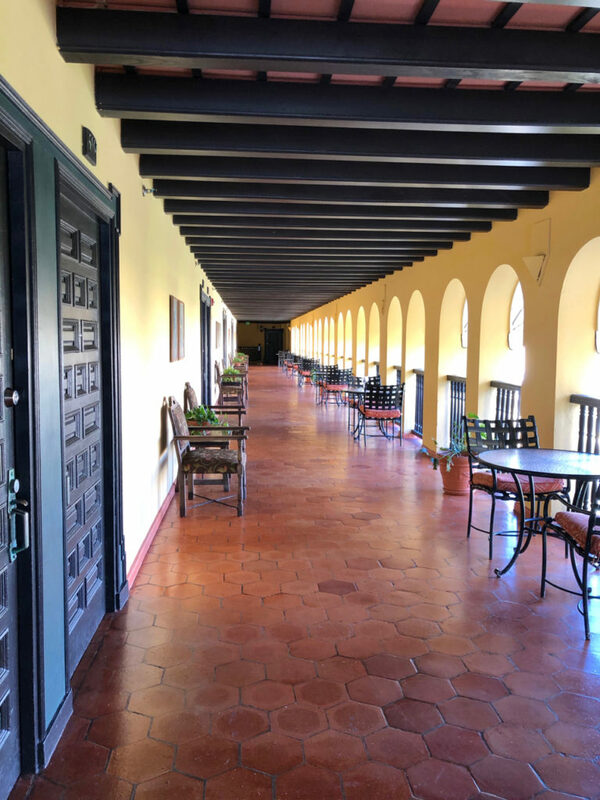 At Hotel El Convento, grab a free coffee or tea from the 3rd-floor lounge and bring it back to your room where you can enjoy it at your own patio table on the peristyle overlooking the courtyard. The resident cat may pay you a visit, and the birds in the old Nispero tree which lives in the courtyard will serenade you. 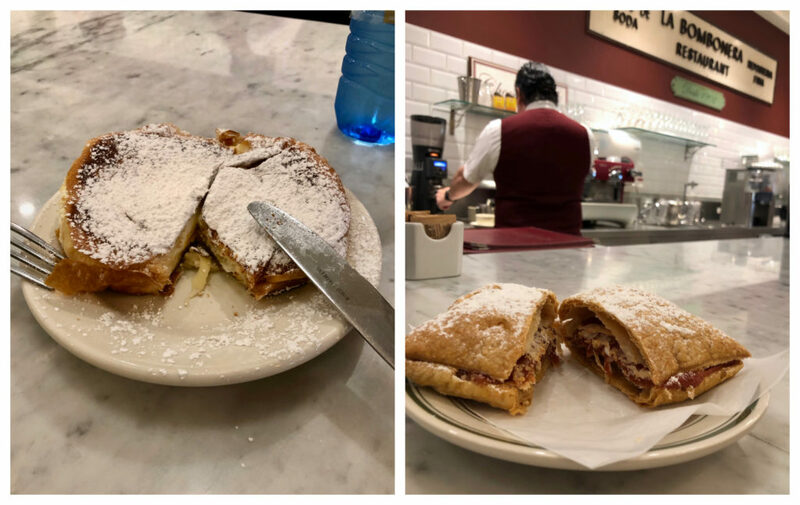 When you’re ready for breakfast, get your walking shoes on and head down to La Bombonera (259 Viejo, Calle San Fransisco) about a 5 walk from the hotel. On the way, check out the morning activities in the Plaza de Armas. There always seems to be something going on here and it’s a great place to watch people. 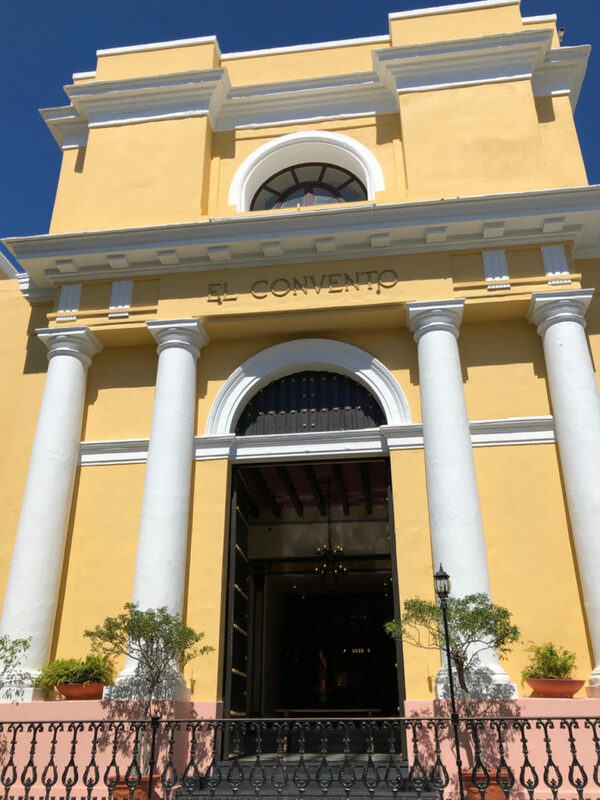 After breakfast, continue east on Calle San Francisco and in the next block, you’ll come upon Parroquia San Francisco de Asis (301 Calle San Francisco). This small(ish) church was built in 1756 and is the perfect place to take a moment to reflect and enjoy its light and airy blue walls and vaulted white ceiling. 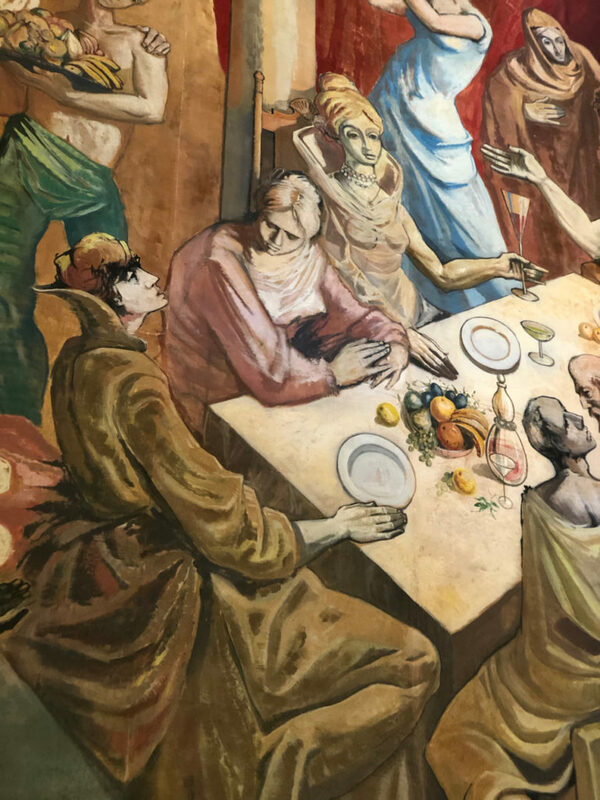 It has an impressive collection of religious art including a magnificent alter mural and, don’t miss the crypt in the basement. Continue on down Calle San Francisco; your next destination is Castillo De San Cristobal. I’ll let the National Park Service brochure tell you all about it (you get one with your admission). 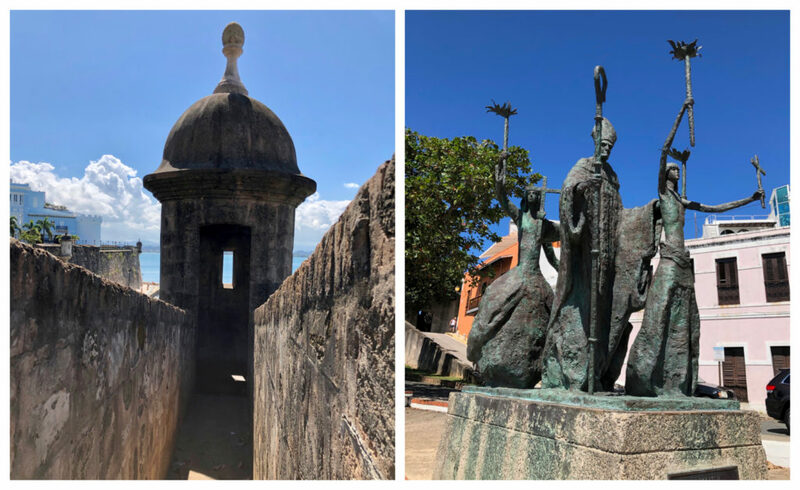 I will say that this fort, begun in 1678, is very impressive and provides some of the most amazing views to be had in Old San Juan from its high vantage point. 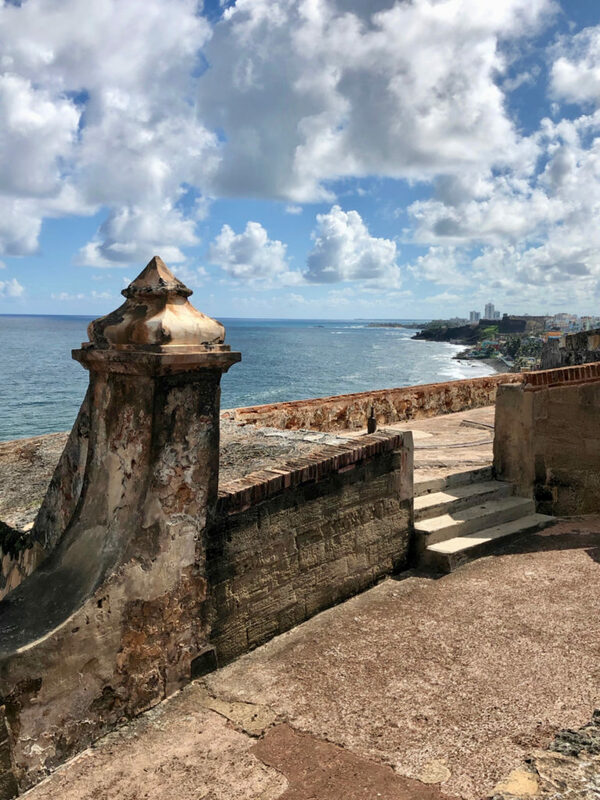 Admission to this park also gets you access to El Morro (another fort) at the west end of Old San Juan, which is equally mind-blowing if not for its history, for its majestic views of the Atlantic Ocean. If you only have two days, it might be too much to work in both of these forts (unless you are particularly interested in forts). You can choose either one and come away satisfied that you visited the best one. If forts with amazing views just aren’t your thing. You can wander around the Plaza Colon (built in the 17th century) at the base of the fort. On my day here there was a small art and crafts fair going on with some good souvenirs to purchase. 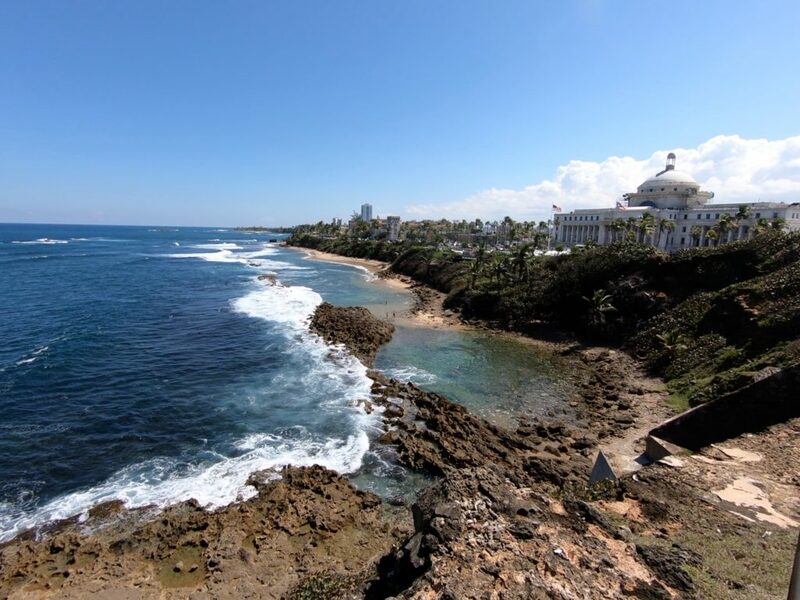 Close by the plaza, there are some note-worthy sights like the Teatro Tapia and the Old Casino of Puerto Rico. 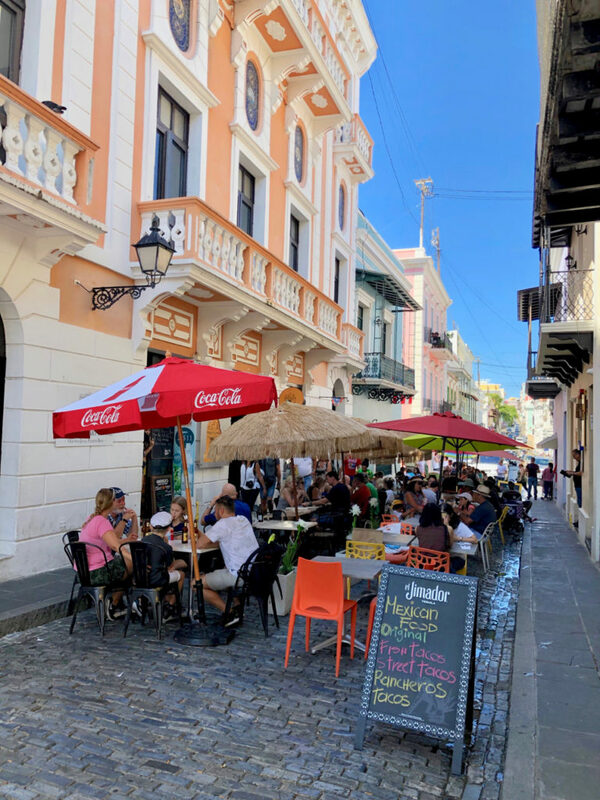 After Castillo de San Cristobal, you can grab a bite to eat in and around the Plaza Colon, but if you can hold out a bit longer, I suggest hiking up Calle Norzagaray which begins along the western wall of the fort. This road takes you up and around the north end of Old San Juan and following it brings you west in the direction of El Morro at the western tip of the peninsula. 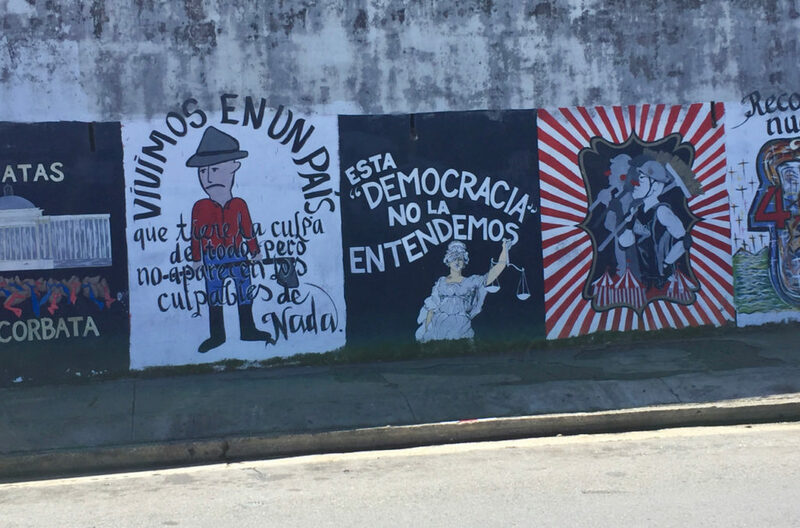 Along this road it is a little bit gritty but there’s some great street art to be seen, and you can look over the neighborhood known as La Perla. If La Perla is anything; it’s colorful. As tempting as it is to a traveler like myself who is easily seduced by gritty, colorful places (and closed doors that clearly need opening), I don’t recommend a visit into this neighborhood. Reports are that the community of La Perla is attempting to rid itself of its drug-related crime reputation. And, although this community has made strides in that direction, I don’t think it is quite there yet and probably should be enjoyed from the top of the old fort wall which overlooks it. 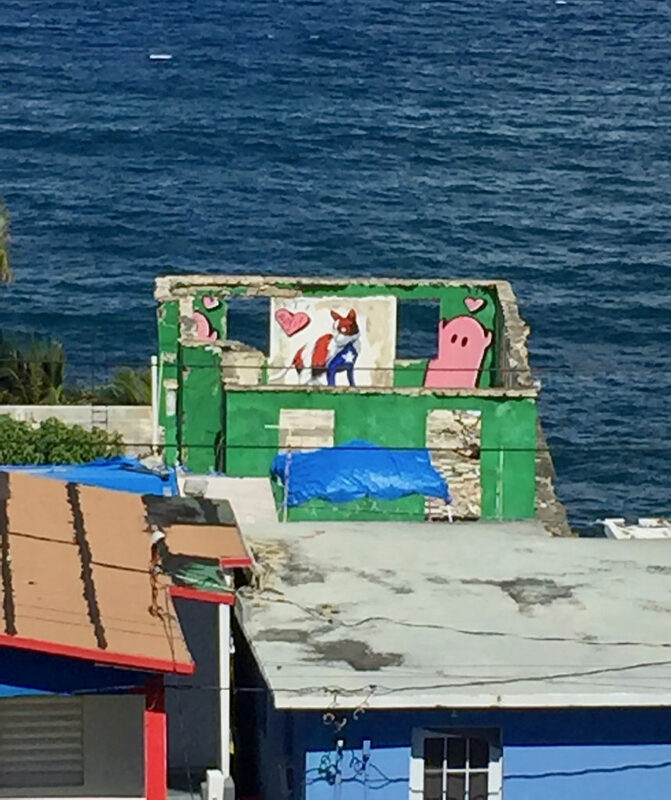 From this vantage point, you can see quite a lot of the La Perla Neighborhood and expansive views of the Atlantic ocean. 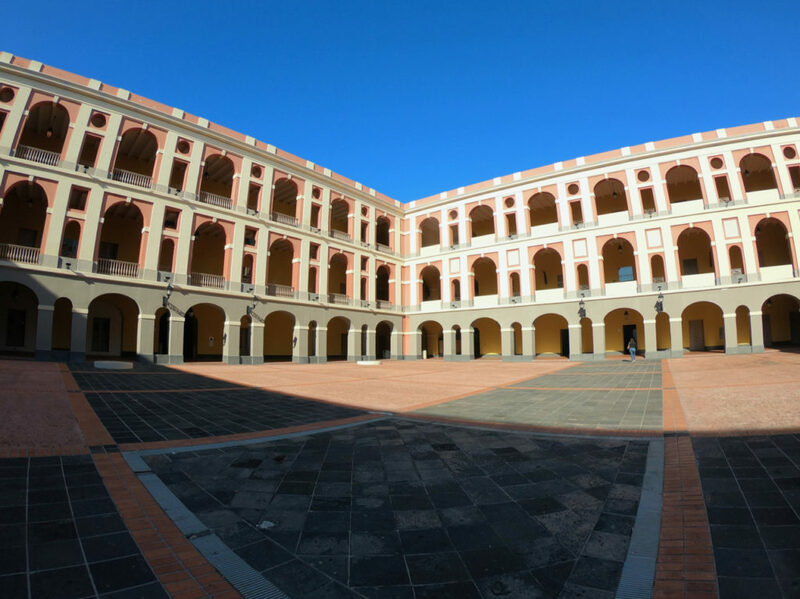 Near the end of Calle Norzagaray you will see the Cuartel de Ballaja (the Ballaja Infantry Barracks), and it is here that you will spend the afternoon. No … not more historical military stuff … well not exactly. Let’s have lunch! The Cuartel de Ballaja is home to at least 3 restaurants (all quite good), but I recommend the Cinema Bar 1950. 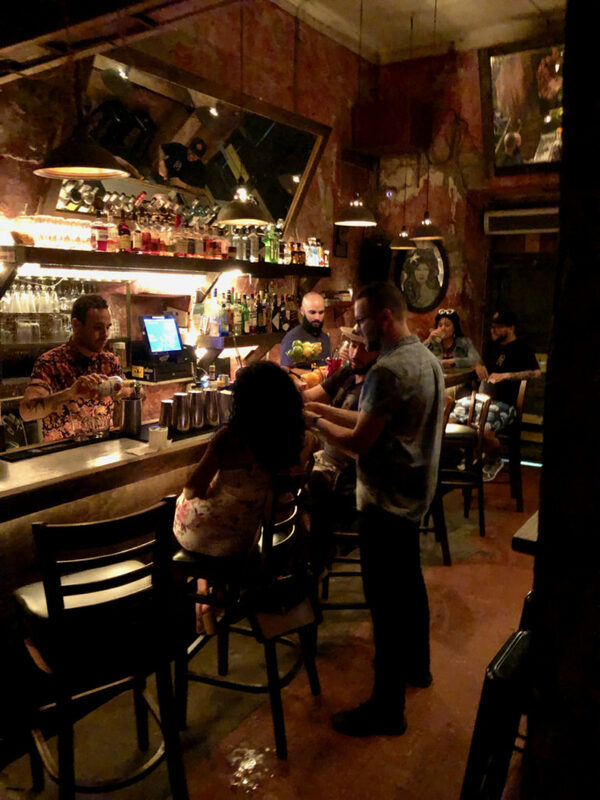 You can sit outside, in the breezeway between the street and the interior of the Cuartel de Ballaja, or in the bar surrounded by an impressive collection of memorabilia. This place houses a movie theater in which you can enjoy a movie while dining and drinking too. I have yet to experience this. One word of caution, the service can be slow, so take a deep breath and get your mojito order in right away. After lunch head into the expansive interior space of the Cuartel de Ballaja. Here’s just a bit more military info. 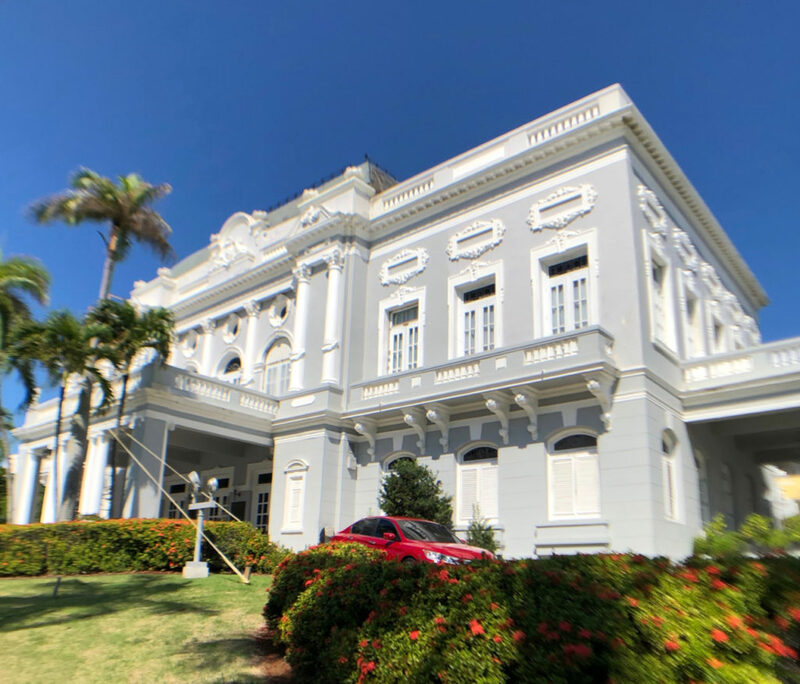 This impressive building, built by the Spanish army between 1854 – 1864, occupies about 3 acres and is the last example of large scale Spanish Monarchy military architecture in the Americas. 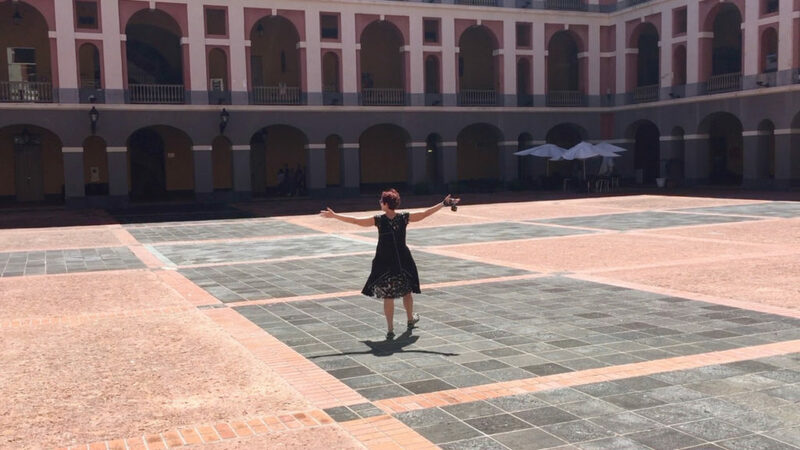 I just love to stand in the middle of the gigantic courtyard and slowly spin taking it all in. Housed on the second floor of the Cuartel de Ballaja is the Museo de Las Americas. They have permeant exhibitions on a wide range of topics from popular traditional arts from throughout the Americas, African heritage, history, music and religious items of Puerto Rico and the Caribbean to name a few. In addition, they usually have a special exhibit to view. On this occasion, it was the art of native son, Jose R. Alicea. On a previous visit, it was Fashion Art. Both were exceptional exhibits. You can check their website to see what they have in store for your visit to Old San Juan. You should be pretty close to knackered by this time, but I have one more place to send you. No worries, it’s on the way home. First, exit out of the north end of Cuartel de Ballaja (if you came in at the restaurant Cinema Bar 1950 this is a good place to go back out). Next, hang a left heading west and work your way around the Escuela de Artes Plasticas. On the far side, you will find a staircase leading down a wooded hillside park. This is Parque Pasivo Viejo San Juan. 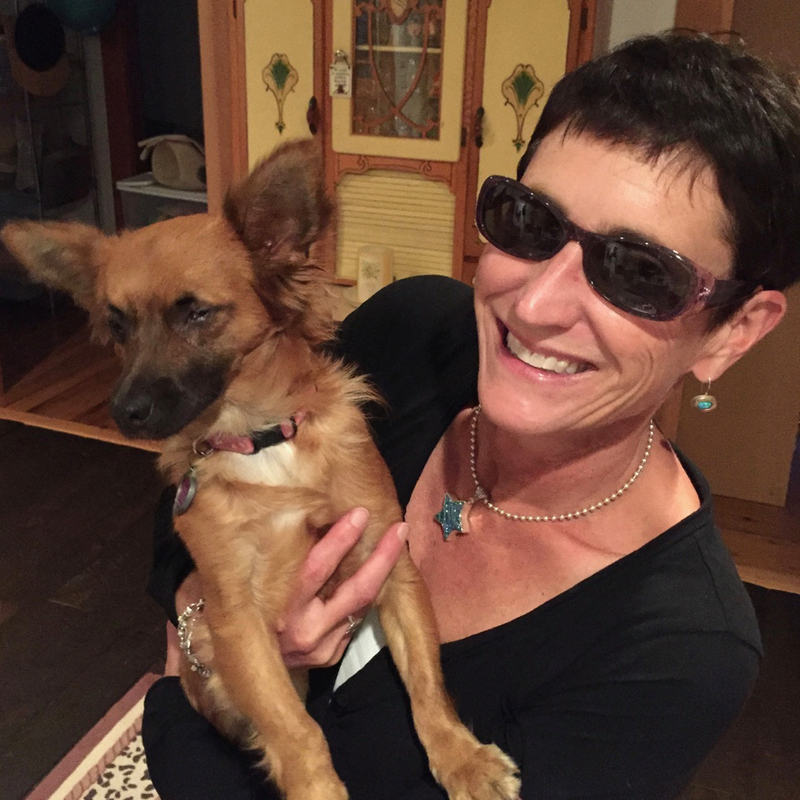 For more about the street animals of Puerto Rico, see my post Saving Lucy – Our Puerto Rico Adventure. From Save a Gato, continue along this lovely tree-lined street stopping to take a look at pretty Casa Rosa. Here you’ll connect with Caleta de las Monjas which you’ll follow to the Plazuela La Rogativa. Take a moment here to view the bronze sculpture “La Rogativa” by New Zealand artist Lindsay Daen and gaze out at the Bahia de San Juan. 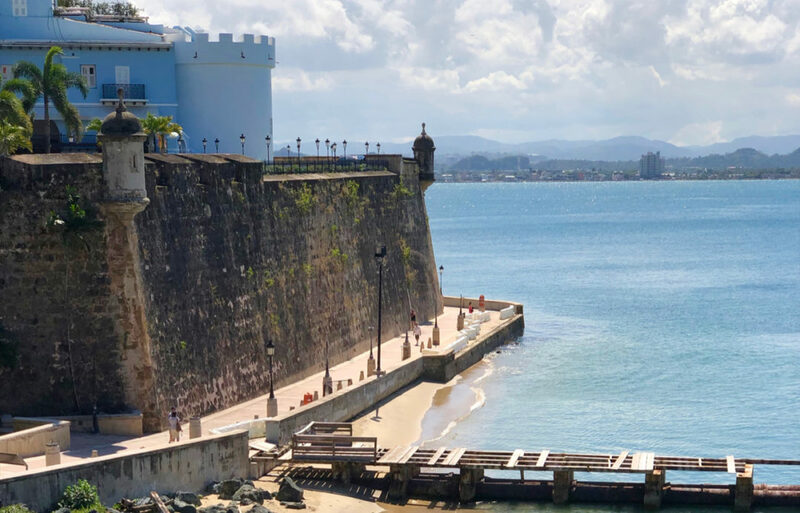 Look to your left to catch a glimpse of La Fortaleza, the governor’s mansion and the city wall. You are just around the corner from Hotel El Convento which you can find by continuing along Caleta de las Monjas. 6:00 starts the wine and cheese party at Hotel El Convento, and it’s a lovely gathering of hotel guests. Since I was on my own at the hotel, I attend the party by myself but made myself a little less lonely by taking the table near my only friend at the hotel, the cat. However, it wasn’t more than a minute before a lovely couple from New England invited me over to their table, and so the cat was left to herself. I actually don’t mind sitting by myself at such things, but over the years that I’ve been traveling on my own, I more often than not get invited to join the table of others. For dinner, head downstairs to the Patio del Nispero Restaurant in the courtyard of the hotel. This restaurant’s open floor plan makes it a refreshing and airy space, and at night it is romantically lit with candles and twinkle lights. 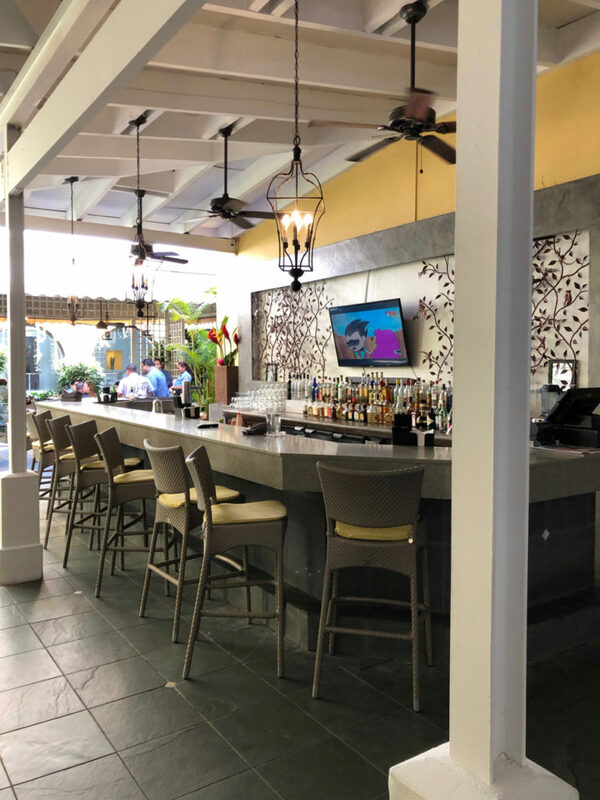 In the states, hotel restaurants often aren’t noteworthy, but this one is with its traditional Puerto Rican offerings and fun bar menu. 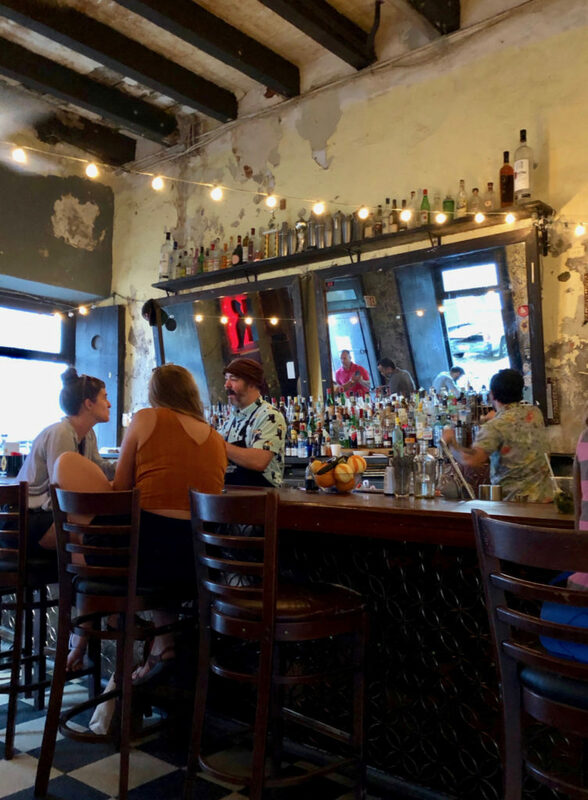 As opposed to going out, I suggest this restaurant for dinner because after the long first day in Old San Juan you may not want to take another step and Patio del Nispero is an enticing restaurant both food and atmosphere wise. However, if you are still game for some walking, there are plenty of excellent options in the neighborhood. CHEERS! 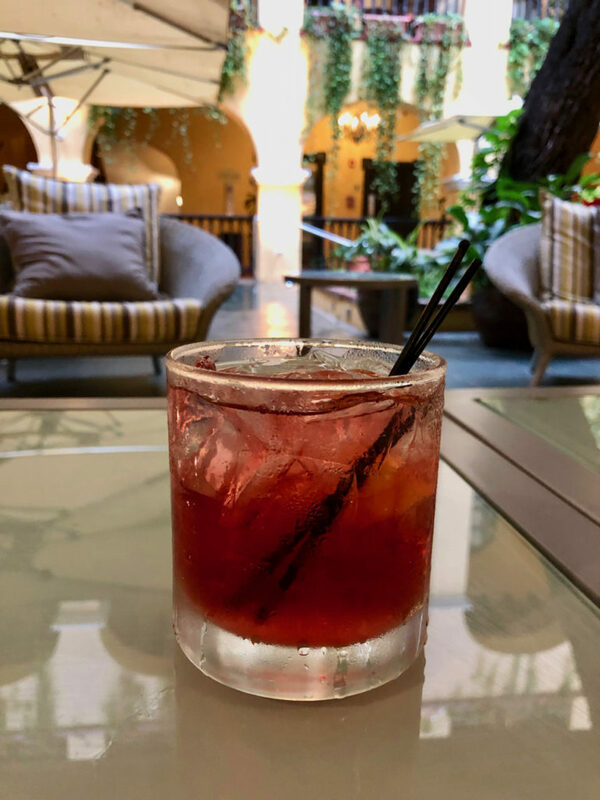 Again, I recommend kick-starting the day with a beverage from the tea and coffee lounge at El Convento and at the risk of being repetitive, have breakfast at Patio del Nispero downstairs. Not only is it good, but this will also allow you time to explore the Salon Campeche and Salon Martorell. Both are magnificent meeting and wedding venue just to the side of the restaurant and worth taking a look at. After breakfast get those walking shoes on again and head straight out the door and to the left. Across the street is the San Juan Bautista Cathedral (151 Calle del Cristo) and if you could resist viewing it yesterday, go over and check it out. 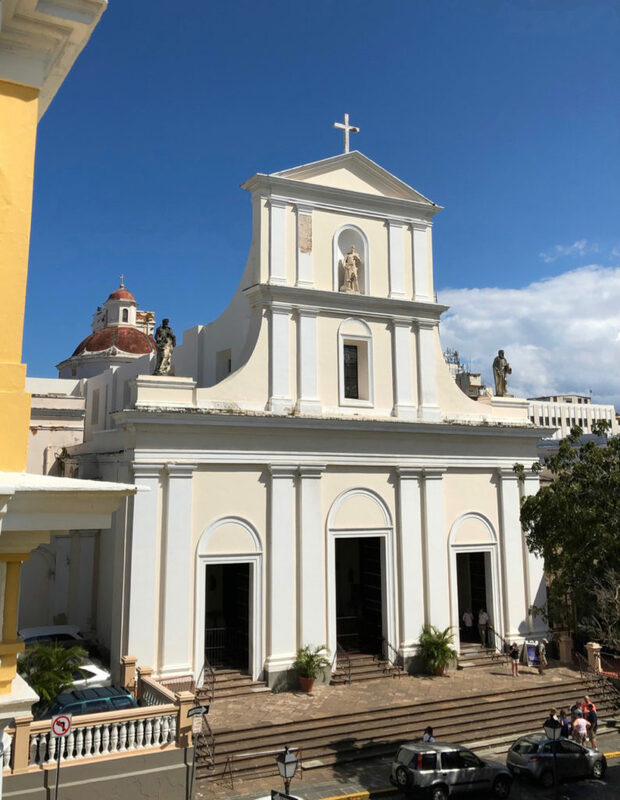 It’s one of the oldest buildings in San Juan and the second oldest Cathedral in the western hemisphere. It was built in 1540 and underwent changes in later centuries with extensive renovation being done in 1917. 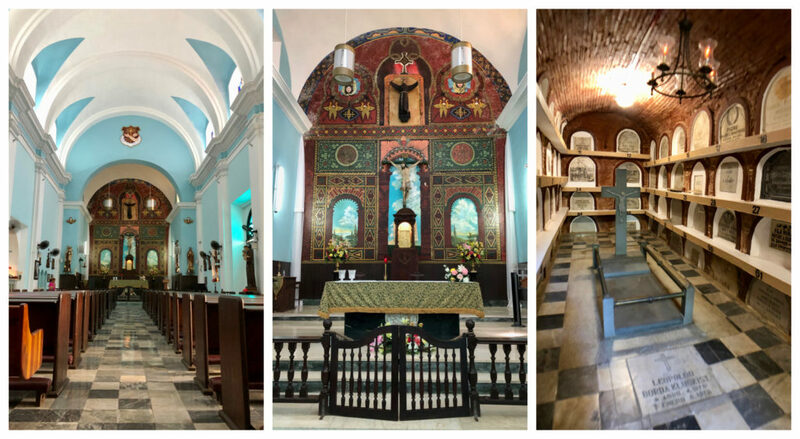 It is indeed a marvel inside with its high vaulted and embellished ceilings, the tomb of Ponce de Leon, stunning stained-glass windows, and the macabre mummy of St. Pio. When you’re finished in the cathedral, exit out the front, and head down the stairs, cross the street and turn right. This is Calle del Cristo, and it will lead you uphill past the exterior wall of Hotel El Convento. Cross the Calle Sol, and about halfway up the next block, you will see a pretty Georgian style doorway that during daytime hours us usually wide open. Just the kind of thing I can’t resist. There is a seat for a security guard but on the day I was there, no one was in it. There are a couple of plaques on the exterior wall but it wasn’t clear that it was a place one could visit, so I hesitantly walked in. Just then a well-dressed man assured me I could enter. Unknown to me at the time because it isn’t in my guide book, this is the Center for Advanced Studies in the former Seminario Conciliar at 52 Calle Cristo. The original building was completed in 1832 and is a beautiful example of San Juan architecture from this time. You can wander through its central courtyard, chapel, beautifully arched corridors, and historic kitchen. If you like history, architecture, and/or inspired spaces don’t miss this gem which you won’t likely see in your guide book either. 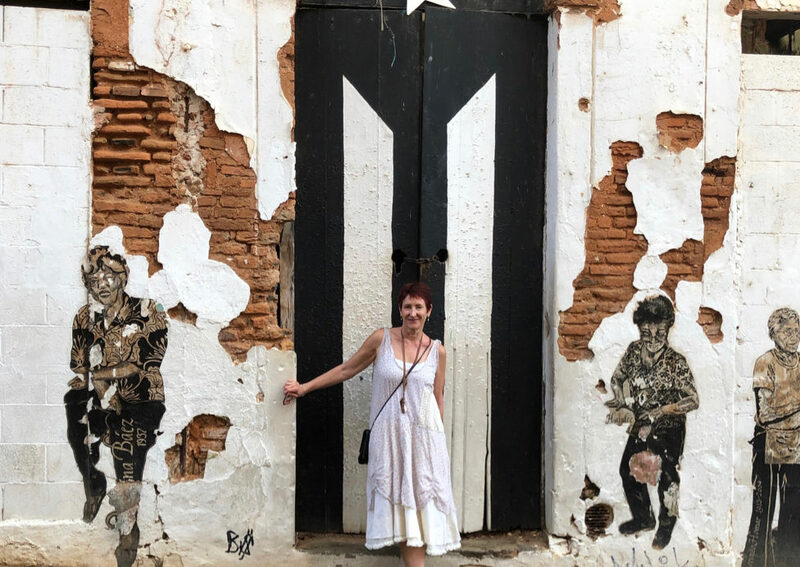 If you have a strong inclination to visit the sister fort to Castillo De San Cristobal, the ticket you bought yesterday is good for 24 hours and will get you into El Morro as well. Continue up Calle del Cristo and follow it to the left at its endpoint. You will be in the Plaza del Quinto Centenario which you might have noticed yesterday because it is next to the Cuartel de Ballaja. 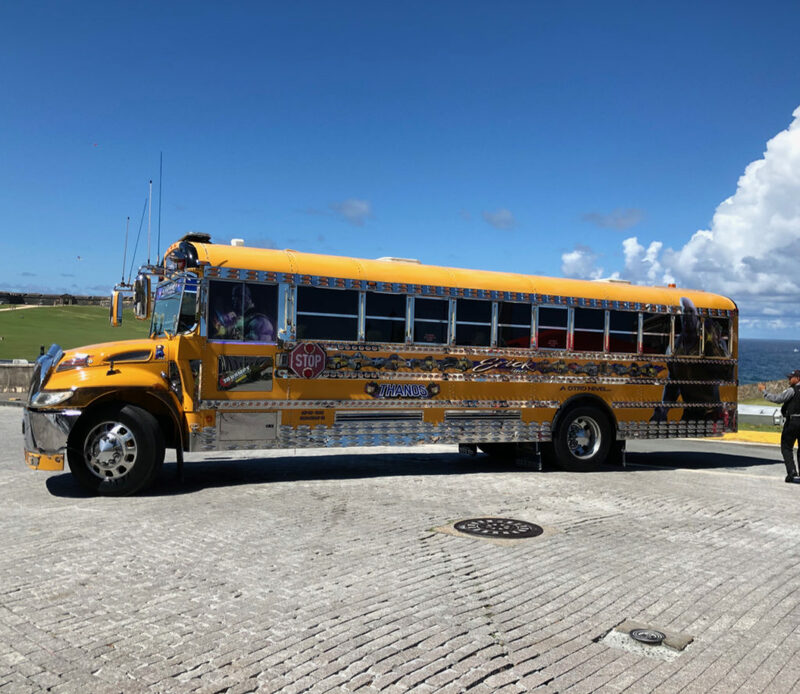 If you want to get to El Morro before your ticket expires continue through the plaza and you will see it across the big green open space to your left. If you aren’t in a hurry to go to the fort, check out the sculptures in the plaza and then walk out to the big open park. Next, head toward the ocean to the right, you can view the Cementerio Santa Maria Magdalena de Pazzi from atop of the fort wall. 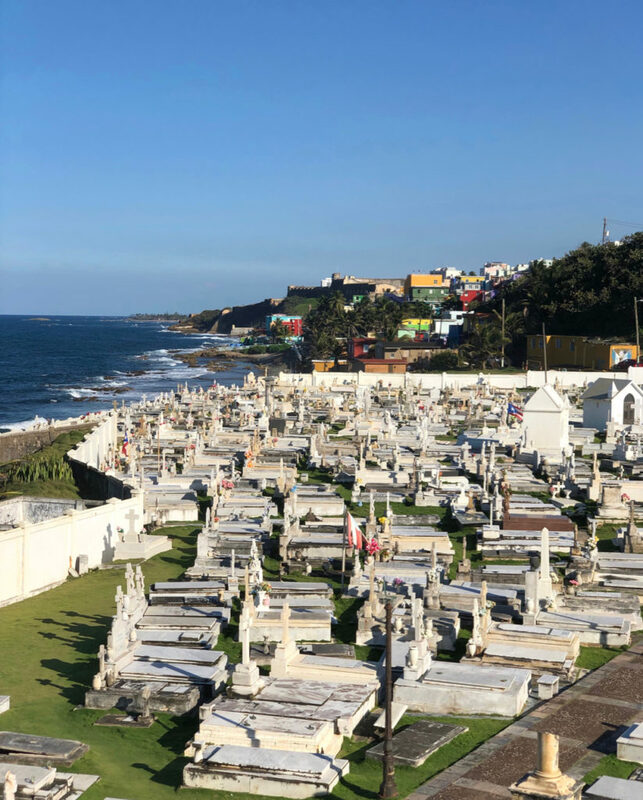 This is an unusual feast for the eyes with gleaming white grave boxes, crosses, and statues juxtaposed to the wide-open Atlantic Ocean, the colors of La Perla, and the historic bastions and fort walls in the distance. As usual, I’m going to make you hike to your lunch, about a 13 – 15 min walk. From the green space at El Morro backtrack toward the Plaza del Quinto Centenario and when you hit the road (Calle Norzagaray) head east. You came up this way yesterday. Go a couple of blocks to Calle San Justo and turn right. Follow San Justo about 4 blocks to Calle San Francisco and go left to 210 Calle San Francisco and have an amazing lunch at Chocobar Cortes. 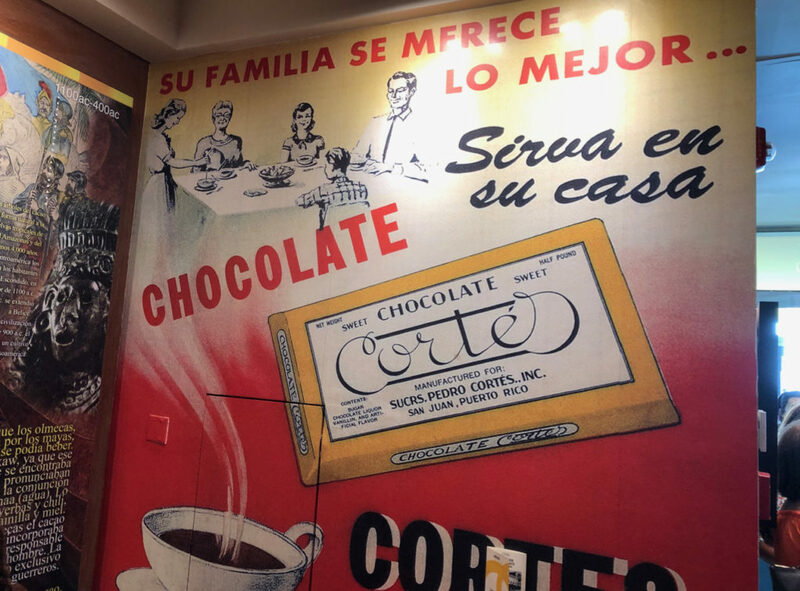 This is the restaurant of the Chocolate Cortes company, representing yet another slice of history with roots in both the Dominican Republic and Puerto Rico. If you are a chocolate lover and/or a foodie, who loves a menu with an interesting twist you have to eat here. They manage to slip chocolate into nearly every dish, beverage and cocktails too. Whether it’s full on chocolate or just a hint of chocolate you’re after, there is a something for you. I was tempted by the chocolate waffles but opted for a chicken sandwich with just a hint of chocolate to it. For this yummy concoction, the chicken was rubbed with a chili coco rub and there was with a chocolate balsamic vinaigrette drizzled over the top. Don’t forget to buy a delectable chocolate bar on your way out! 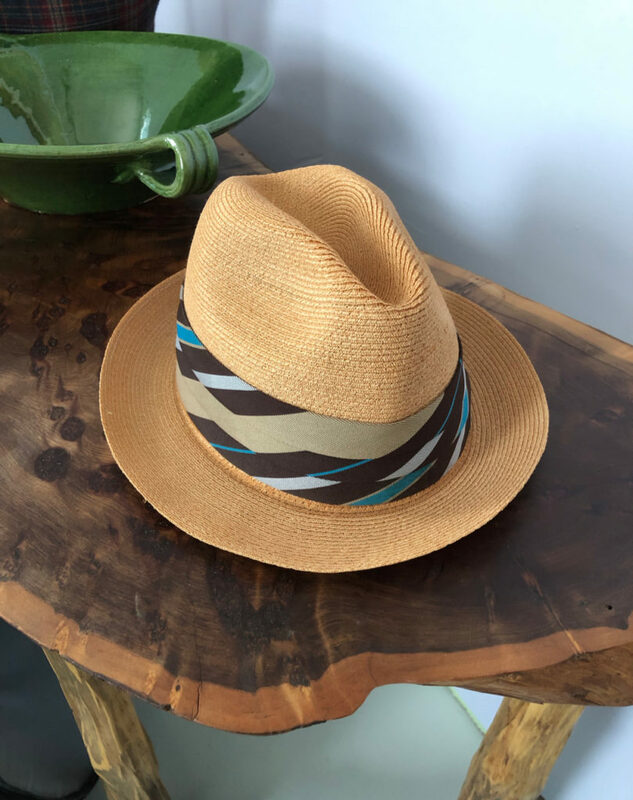 No trip to San Juan would be complete without a Panama Hat; an authentic Panama hat. Head back to Calle San Justo and hang a right. Follow it down to Calle Fortaleza. Turn right. This street has lots of shops selling everything from souvenirs to cigars to jewelry. If there is a cruise ship (or 5) in port, it can be bustling, to say the least. Still, work your way along and find Ole (look for the signature green awning) at 105 Called de La Fortaleza. Here you can get a Panama hat fit to order and finished with a ribbon of your choice. There are also other curious things to buy in this shop like Santos, art and other trinkets. If you’re up for additional shopping, continue in the same direction (west) on Calle Fortaleza and go right at the next intersection onto Calle del Cristo. Galeria Botello is just up ahead at 208 Calle del Cristo. The building and the art within is exquisite, and a must see in this part of town. 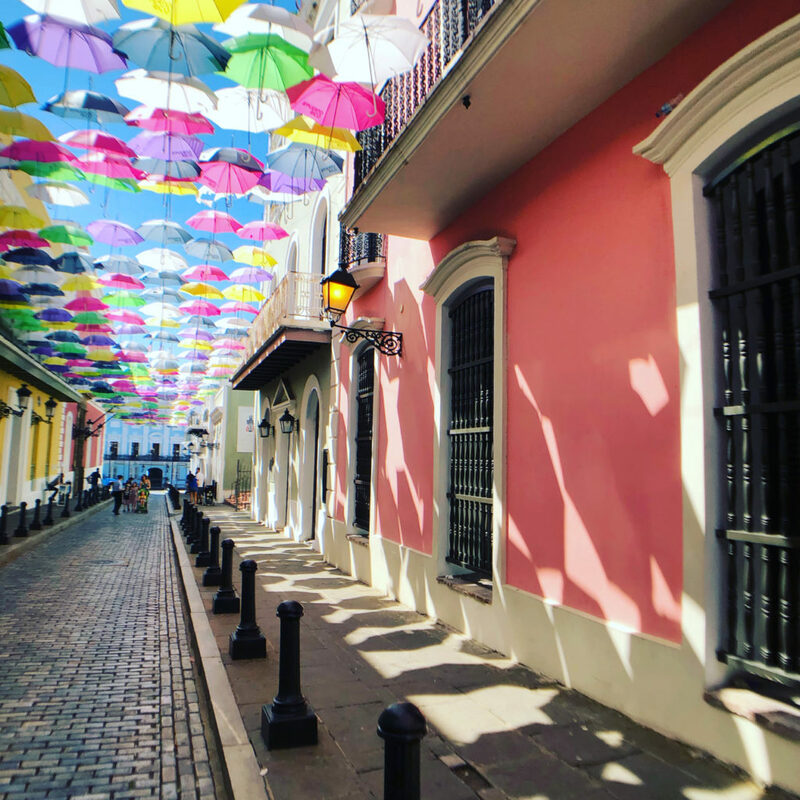 From here, backtrack to Calle Fortaleza and head right to see the fantastic canopy of umbrellas that criss-cross this part of the street just before you reach the governor’s mansion, La Fortaleza. It might fit here that I encourage you to visit the governor’s mansion but I have yet to do this so can’t recommend it. If it seems doable in this afternoon, go for it and let me know what you find out. Come back to the intersection of Calle del Cristo and Calle Fortaleza and head south down Calle del Cristo. One short block brings you to three notable sights. The first is the Casa del Libro. This small museum is little known but a beautiful place to visit with a breezy open design. It is dedicated to books and printmaking. 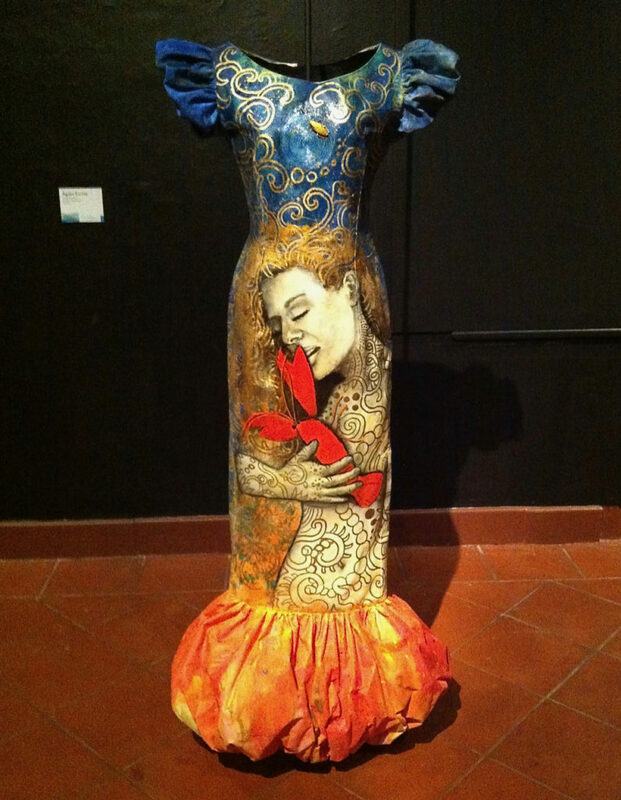 On my visit here, there was an excellent exhibition of the mixed media work of Jorge Sierra. There are also permeant collections of art and historic printing presses to view. I would have loved to have taken some pictures in this beautiful museum, but some signs said “no photography.” Since I don’t always obey signs (and had no sinister plans for my photos), I tried to take a picture via a secret way that I have, but, the second I opened my phone, I got an alert saying, “no photography”! How did they do that?!?! Next, across the street from Casa Del Libro, is Parque Las Palomas and if you don’t mind lots of pigeons, pop inside and have a look around and take in the spectacular view. Next door to the park, is the Capilla del Santo Cristo de la Salud. This small structure is worth a look from the outside and is tricky to get inside. I have never made it here when it is open, but it is reported to have some lovely Campeche paintings on display. The hours that this chapel is open are very limited so check the internet before you go or just enjoy it from the outside. It’s time for more sugar I think. Slip around the side of the Cristo Chapel and head down Calle de Tetuan to Senior Paleta at 153 Calle de Tetuan. This small shop serves up frozen gelato and sorbet pops in a dizzying array of flavors and made with the best natural ingredients. There are straight fruit flavors, mixed fruit flavors, chocolate, coconut, and unusual ones like tamarind, Nutella, and nougat. 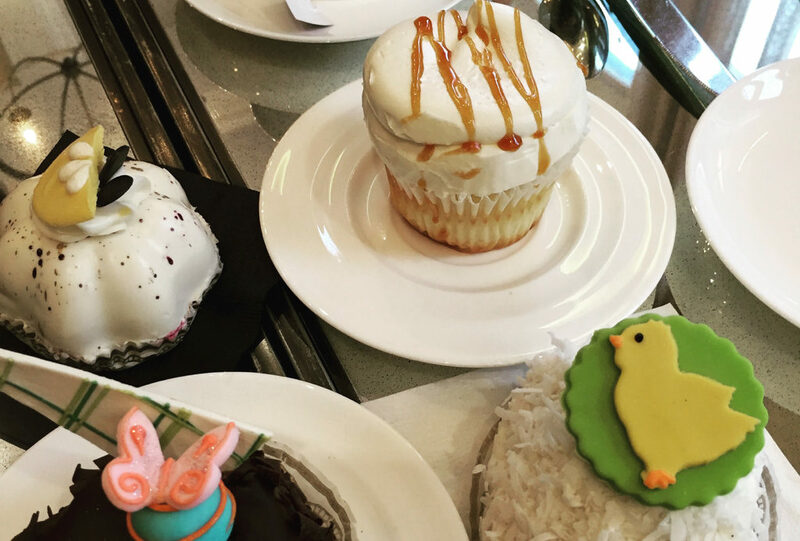 Whatever you decide on, if you can decide, the taste will amaze and delight you. 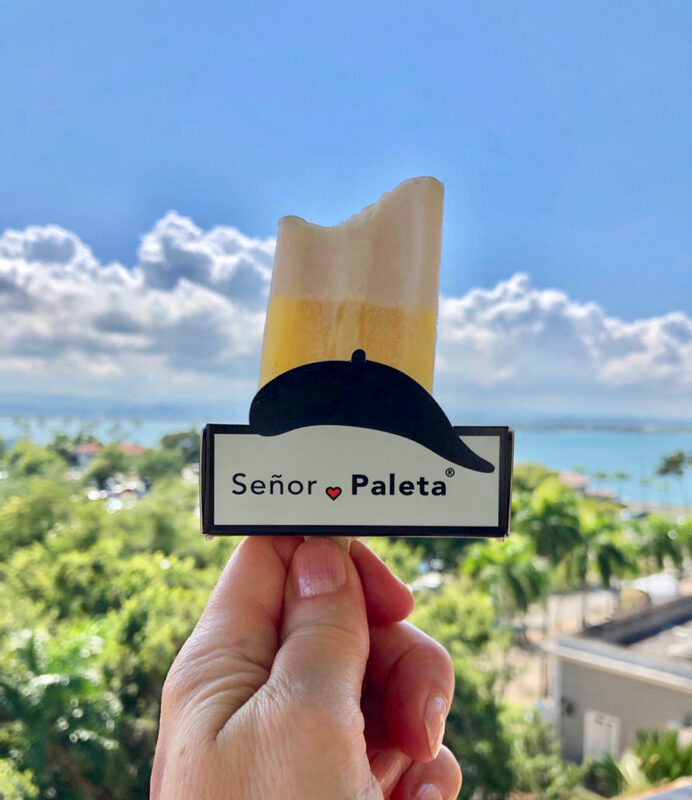 Enjoy your cool down on a stick across the street where you can sit on a bench and look out over the Plaza Infanta Luiza, the Bahia de San Juan, and the cruise ship piers. Now, let’s go for a swim. Backtrack on Calle de Tatuan a half block to Calle San Jose and take a right. Go two blocks to Calle San Fransisco and go left. Go one block to Calle del Cristo, and you’re a block from the Hotel El Convento. If it’s been a sunny day, you are likely hot and, after almost two days of walking, the pool is the perfect place to take a load off. You can have a drink delivered to the pool from the bar downstairs and plant yourself in the full sun or under one of several umbrellas. Life is good just about now. Fully refreshed, get yourself gussied up in your favorite dress and head over to La Factoria for happy hour. The address for this place in google maps is a little bit misleading and since there is no sign on the bar’s door (at least not one that says “La Factoria”) you should go to the corner of Calle San Jose and Calle San Sebastian. La Factoria is right on the south-east corner of the intersection. From El Convento, it’s just a short two blocks up Calle del Cristo heading north and one over to the east (right) on Calle San Sebastian. La Factoria is known for its gritty and hip atmosphere and their inventive and delicious artisan cocktails. The bartenders are very friendly and super knowledgeable about all things booze. My husband joined me this evening, and we were here starting at about 5:30 pm. There was a small crowd of mixed ages gathered. I noticed a closed door behind the bar that, every now and then, someone would open and disappear behind it. Of course, I couldn’t resist. Behind the door and a little way down a dark corridor was another small bar (officially not open until 6:00); dark and mysterious but not uninviting. Beyond that, further down the dark hallway, there was a third bar (officially not open till around 8:00 pm). 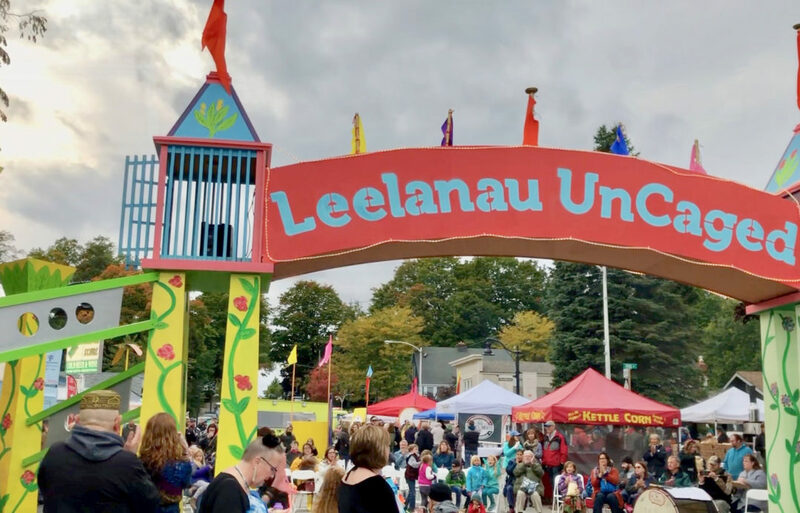 This one was large with contemporary artwork displayed on the walls, a crazy patterned old hex-tiled floor, a bandstand, and divided seating areas. Although we didn’t stay until 8, I learned that this is the place for dancing the night away. La Factoria, though thoroughly modern, has a mysterious speakeasy vibe that transports patrons out of everyday life. Magical! Don’t drink too much at La Factoria because you don’t want to be wobbly when you make your way back to Call de Tetuan were you were earlier in the day. Follow Calle San Jose in a straight shot south for 5 blocks, and take a right to find Verde Mesa at 107 Calle de Tetuan for dinner. The only drawback to Verde Mesa is they don’t take reservations. We had a pretty long wait, but they kindly took our phone number so we could walk around while until they could seat us. Since we were getting super hungry, we decided to sit and have a tapas at the place right next door called T.tuan Old San Juan at 101 Calle de Tetuan. 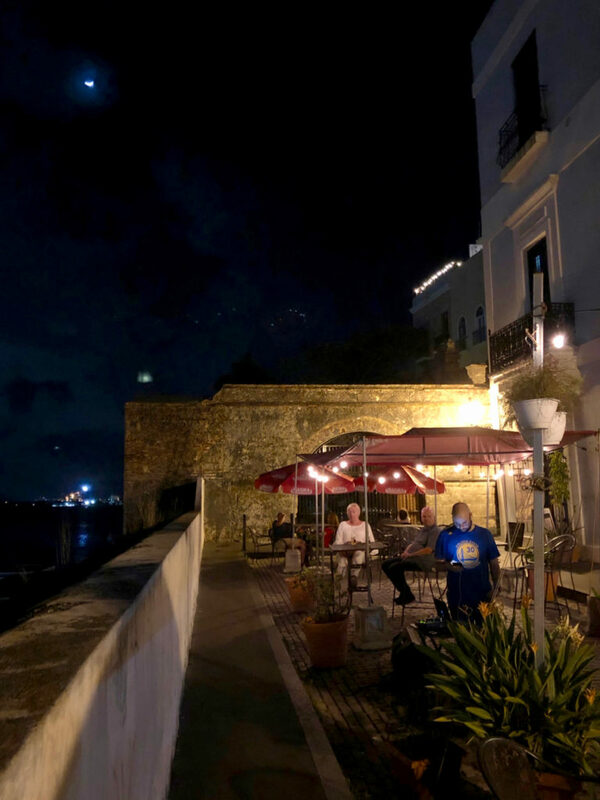 This restaurant has outdoor seating with low lighting to preserve the excellent view looking over the bay with the city lights of great San Juan in the distance. The view was spectacular, and the tapas were delicious. This place would be a great choice for dinner on another occasion. We saved room for our dinner at Verde Mesa, and it was worth the wait. With a decor of marble-topped tables, mismatched vintage chairs, old cupboards, tin ceiling, mirrors and an array of old dishes and mason jar glasses it was something straight out of Paris. Since it was approaching Valentine’s day, it was also tricked out with decorations to mark the day. The menu is farm to table style with locally sourced foods and everything super fresh and homemade. Despite the tapas for appetizers, I just had to try the goat cheese topped with green tomato chutney and plantain chips. It came sweetly garnished with flower petals and pea tendrils. Extraordinary! For dinner, since I was getting quite full I had the vegetarian offering of Arroz Verde; a dish of rice with mixed vegetables, sprinkled with cheese and Verde sauce. My husband had the beef with roasted beets, local vegetables, and beans. Both dishes were elegantly presented and super tasty. If you have any energy at all, take a long stroll home and enjoy the streets of San Juan at night. The same buildings you passed in the day are transformed by the low lights and cool evening air. Linger in the city as long as you can and then find your way back to the Hotel El Convento and the comfortable bed that awaits you. Enjoy the hotel’s old fashion turndown service complete with chocolates. Sleep well and dream of the magical, one of a kind experience you’ve just had in Old San Juan. WHAT A GLORIOUS TRIP! Yes. You made me fell as if I were there! Pics are FANTASTIC! Thanks.